You are here: Home / Life Around DFW / Staycation Or Vacation In Arlington, Texas! Be sure to check out the list of other great places across the country to visit at the bottom of this post! The 15th Anniversary Season will feature guest artists such as Cliburn contestant Lindsay Garritson performing Prokofiev’s Piano Concerto No. 2, pianist Juan Moreno performing Turina’s Rapsodia Sinfonica, Op. 66, flute soloist, LeeAnne Thompson performing Liebermann’s Flute Concerto, and violinist/Concertmaster Susan Demetris performing the Barber Violin Concerto. Symphony Arlington will also feature Paul Silverthorne, Principal Viola of the London Symphony this season performing Paganini’s Sonata per la Gran’ Viola è Orchestra and Berlioz – Harold in Italy! The Levitt Pavilion has become the place where families and friends of all ages and backgrounds gather to experience 50 nights of FREE music, dance and performing arts every year. The Levitt Pavilion brings the magic of music and the performing arts to Arlington in a whole new way – under the stars! Our performance schedule includes artists from all around the world and right in our own backyard, from jazz to hot Latin rhythms and world music to children’s artists. There is always something new at Six Flags Over Texas. You and your family can experience our expanded kids area, Bugs Bunny Boomtown. During the summer, BATMAN™ The Ride celebrates 15 years by doing a gravity-defying role reversal — ride it BACKWARDS! Our popular Membership and Season Dining Pass programs are returning too. There are now two exciting ways to tour the Cowboys Stadium. If you are interested in touring the entire stadium, and going home with a head full of facts and figures about the world’s largest domed structure, then the VIP Guided Tour is your best option. If you’d rather take your time and explore just the most popular highlights on the Event Level, then the Self-Guided Tour is for you. Beulah Adams Marshall bought land here along the Bankhead Highway in the early 1920s and opened a tea room, hosting teas and serving dinners to Dallas and Fort Worth patrons. In the late 1920s, Fred and Mary Browning purchased the property and shortly began converting the facilities into a casino, adding an escape tunnel and secret room for hiding the gambling paraphernalia during raids. Known as Top O’ Hill Terrace, the popular spot attracted gamblers as well as visitors who were often unaware of the gaming activities. The restaurant, along with the tea garden that exists today, was a legitimate business, operating alongside a brothel as well as the casino, which benefited from the nearby Arlington Downs Racetrack. 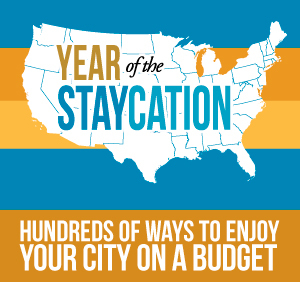 Check out all of these great destinations for your vacation or staycation this year! Bloggers from all over the country explore their towns with you!